A few months ago I had to pleasure to meet up with Vincent Hollaar from Sonos Netherlands and discuss creativity within Sonos. Hi, I’m Vincent Hollaar, I live in Almere with my Mexican wife, my dog and cat. I enjoy playing waterpolo and walking in nature with our dog. 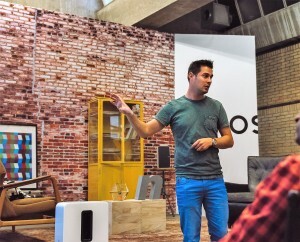 I’m currently the Sales Director of Sonos Netherlands. I have been working now for over 10 years in the consumer electronics industry, first for Microsoft and now at Sonos. What are the creative aspects of your profession? The Consumer electronic retail environment is changing fast. The number of doors closing due to bankruptcy, movement towards online and the lack of proper experience and inspirations points needs us to be creative. How does retail look in 4 years from now and how should we be present? Where will we put our next Sonos Experience. How can we build this and control this ourselves? We need to be creative and stop thinking in the traditional way of selling consumer electronics products. What is needed for you to be in your creative zone? First of all, time to think about the exact challenge (alone and not disturbed by any person or device). Describe as precise as possible what the exact problem is. Then, think of a direction you want to move and picture a dot on the horizon. After that, it’s time to involve people around you, who are completely different than yourself and brainstorm how to get towards that dot. Make a plan based on that input with the team. So, the team is part of it and feels committed. How do you know something is going the right direction? Most of the good ideas are relentlessly progressive. This means that it has not been done before. Therefore, you don’t know what it will bring. But if it is in line with the long-term strategy and you feel the positive energy in your team and with your partners, you know it will deliver positive results. What do you like the most about being creative? Doing something new. Get new fresh energy for myself and my team. What do you do when you feel out of creativity? Don’t force it. That never works. What work best for me? Make some notes on the topic. Take a relaxing moment in the weekend, get out in nature with my dog and creative ideas will pop-up. Can we see/hear something of your creative results? The best visual example I can give is the “Sonos Living room”. Buying Sonos in a standard electronics store is not inspirational. 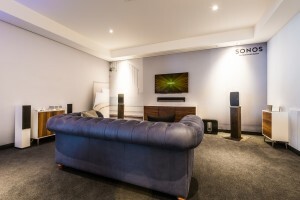 You don’t know how it looks in your house, you don’t have the right listening area, you don’t get into an environment where you can take your time to consider and test the right Sonos setup for you. We decided to find around 25 locations in the Netherlands where we could create the right setting in a closed listening area. The walls are giving a living room feeling. Nice decoration. Not tech at all. You can listen to Sonos in several setups. The employees are trained extra on the products. These are the key experience stores people want to go to. The turnover, cross and upsell are showing all positive results. The investment of these room is minimal. A healthy ROI, satisfied retailers and customers are positively surprised by this experience. What is your favorite app at this moment?